In the past, January 1 had been the Theme Day for our best photo. This year, today has been declared a Blog Day by the City Daily Photo community. I've taken some creative license with the theme day, as it gives me the opportunity to share some of my "other" photos. This is my best photo for 2009, regardless of location. 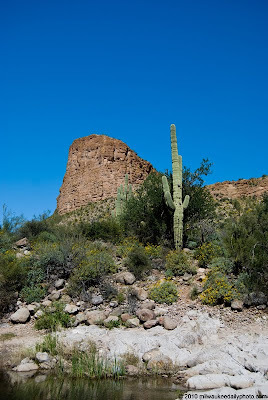 Taken in Tortilla Flat, Arizona this past March, today's photo is a stereotypical desert scene. I really loved the color, scale, and variety in this photo, and it has definitely become one of my favorites. I love all the textures and contrasting colors in this photo. A great choice!